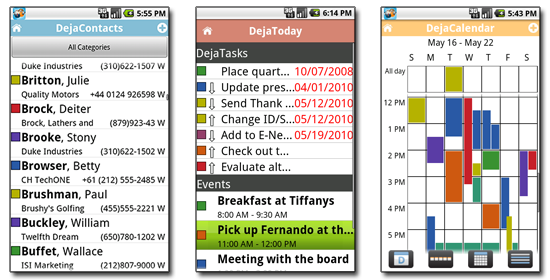 DejaOffice, a robust suite of contacts, calendar, tasks and notes apps for Android, allows you to assign color-coded categories to your contacts and calendar for easier organization. If you manage a large amount of contacts, splitting them up into categories can make it much easier to find the records you need. DejaOffice includes a category manger to create and rename global categories for use across contacts, calendar, tasks and notes. DejaOffice also supports automatic sync of Outlook categories using the CompanionLink PC software. Once DejaOffice has been populated with categories, its easy to assign them to your contacts and calendar. Just select the record you wish to modify, press Menu and select Edit, and then tap the Category button to bring up a list of categories to select from. Save the record and you’re done – easy!